Sunny. High 79F. Winds S at 5 to 10 mph.. The traffic congested corner of Alvarado and Sunset does not seem like the place where you would want to live in a high-priced apartment next door to a car wash. But only steps away from this Echo Park intersection on Alvarado Street, the five-story high, Echo Ten Thirty Lofts opened its door about two years ago with asking rents for its 20-loft-style apartments priced as high $3,895 a month for two-level units. 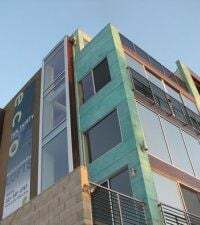 Now, the owners of Echo Ten Thirty Lofts, where a Crossfit gym just opened on the ground floor, have put the approximately 27,000 square-foot building up for sale at an asking price of $9.3 million. Sales information on LoopNet shows that apartment rents currently range from $1,495 to $3,555 in the building, which includes a parking garage with 38 spaces. The listing for the LEED certified structure to such shops and restaurants as American Apparel, Mohawk Bend and Starbucks. “Both the subject property and the area have been attracting successful professionals in the fields of new media, entertainment, social networking, architecture, arts and design,” says the sales brochure. So, is all this worth $9.3 million? Brock Harris of Brock Real Estate has his doubts.